﻿ Top Food courts: What is in their bucket? Top Food courts: What is in their bucket? This change in the retail segment will see the rise of a few of the best food courts in India starting right from the Select CityWalk mall, DLF Place - Saket, Quest Mall - Kolkata, Express Avenue - Chennai, Orion Mall - Bengaluru and to Cyber Hub. The retail scenario in India is going to change over the next few months as mall developers and managers are focusing on getting the best food brands at their locations. Or, we can say that the retail segment once captured by the luxury and the accessory segment is being replaced by food outlets in the country. This change in the retail segment will see the rise of a few of the best food courts in India starting right from the Select CityWalk mall, DLF Place - Saket, Quest Mall - Kolkata, Express Avenue - Chennai, Orion Mall - Bengaluru and to Cyber Hub - Gurgaon all of these have been turned into a complete food mall. Food is a major footfall driver today in any of the malls and food courts that give single customers and entire families the option of a variegated choice of cuisines. “As such, food courts are often a primary reason for people to visit malls in the first place. Since they are usually on the top floor, customers are required to pass all floors below to access them. This increases the opportunities for impulse shopping. Food courts also boost overall sales because they offer panoramic views of what is available at the lower levels, thereby raising aspirational levels,” said Shubhranshu Pani, Regional Director - Retail Services, JLL India. Are food courts ‘cooking up’ the right biz? As food courts are generally a mix of all the food formats starting right from QSR, casual dining, fine dining, fast casual and a kiosk, it has always attracted a mix of set customers. And as it is an open format; it goes with the taste of an entire family at one stop. Meanwhile, as it offers a mix of all the categories, food courts are seen as a cost-effective multi-cuisine space. “Food courts are universal revenue generators. No matter how badly a mall is doing, food courts will pull crowds on their own steam. For this reason, there is no likelihood of rentals for food courts increasing. Along with anchors, these represent the factor that brings in assured footfalls, and no mall owner would risk making food court occupancy less tenable and attractive by increasing rentals,” added JLL report. Designed with a touch of modern and a traditional décor, Select CityWalk mall, Delhi has become one of the top food courts in India, named, ‘My Square’ food courts, which is a joint venture between Select CityWalk and Everstone Capitals to promote the ever-growing demand of food in India and open food courts at various locations including a mix of malls and high streets. “Earlier, we used to allocate over 17-20 per cent space to food retail formats which is now increased to 25-26 per cent with increase in footfalls which contributes 20-25 per cent of our business,” said Yogeshwar Sharma, ED, Select CityWalk. On the other hand, DLF promoted Cyber Hub and Saket Mall has one of the top food courts located. Cyberhub is giving more revenue than any other mall as it is getting a heavy footfall and traffic not only on weekends, but also on weekdays because of the location at which it operates. Having located at the IT- hub where MNCs and corporate offices operates, the mall pool over six lakh crowds from nearby offices and residents on weekdays and weekends, respectively. Not only this, the mall has a combination of the top trending restaurants in India in terms of footfall and cuisine they offer including Farzi Café, Café Delhi Heights, Starbucks, Dunkin’ Donuts and Olive Bistro amongst others. Likewise, DLF promoted Saket mall is next in the queue to generate the bigger footfalls from its mall. Having partnered with brands like Kylin, Sushiya, Smoke House Deli, Haldiram’s, Yo!China and McDonald’s amongst others, the food court offers a cost-effective list of a wide variety cuisine in its plate. Located at the top floor of the mall, the food court gives clear visibility of all other sections making way out for other segments located in the mall. “Mall culture in India has evolved and is woven through many stages, now after every 7-8 outlets, there has to be a food outlet,” said Benu Sehgal, VP, Mall Head, DLF Place, Saket. “We have 20-25 per cent of the total footfall generated from the food courts,” added Sehgal. 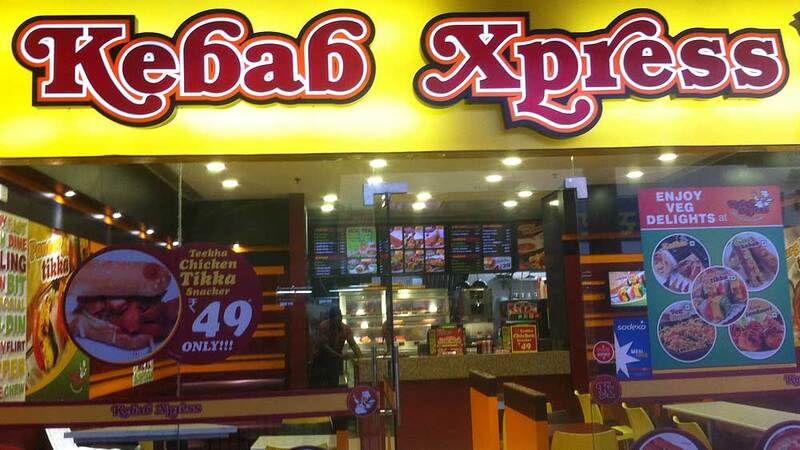 Going on the same line, Express Avenue located in Chennai is another mall which has food courts as one of the biggest contributors in overall business. Having worked on the concept of good ambience, multitude of options, brands and speedy service, the food court here is named as ‘EA Garden’ and true to its name, one can feel like sitting in a garden and eating favourite food. “Food court is the heart of our Mall which constitutes between 15 to 20 per cent of our footfall. And we have an average footfall of over 1.5 lakh to 2 lakh per month,” shared Ganesh CV, Vice President – Leasing & Marketing, Express Infrastructure Pvt Ltd.
On the other hand, Quest Mall of Kolkata has an average footfall of over 2, 00,000 to 3, 00,000 people per month. Operated on few basic ingredients, the mall has a mix of local flavours, what people like, international brands and ensures hygiene factors which has made it one of the successful food courts in Eastern region. Thus, we can see that Food Courts are universal revenue generators in a mall. No matter how badly a mall is doing, food courts will pull crowds on their own energy. Wendyâ€™s goes local, voices â€˜Qualityâ..